Using dotCover, we can run coverage analysis on our code. We can verify which portions of our project are covered by unit tests and which are not. However, there are times when we don’t want to perform analysis on our entire project and instead want to target certain areas. This can be because we want our coverage analysis to run faster or because we want to exclude third-party or obsolete assemblies or classes from the resulting report. Let’s have a look at how we can setup coverage filters using Visual Studio. Since dotCover also comes with a console runner, we’ll have a look at setting up coverage filters there as well. 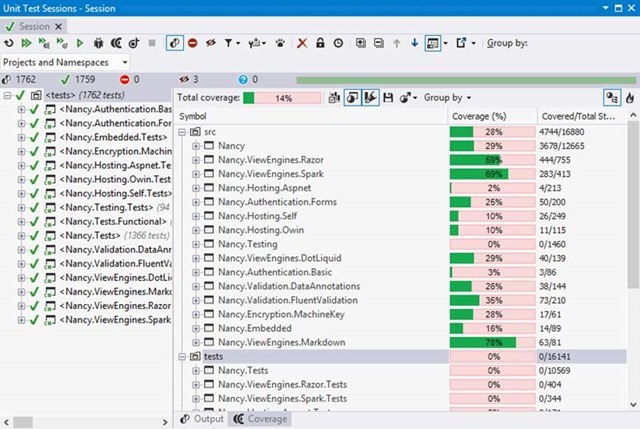 In the screenshot below, we can see test and code coverage results after running all unit tests for the Nancy framework. Code coverage has been run for all projects we’ve been testing, but also for our unit test assemblies themselves! 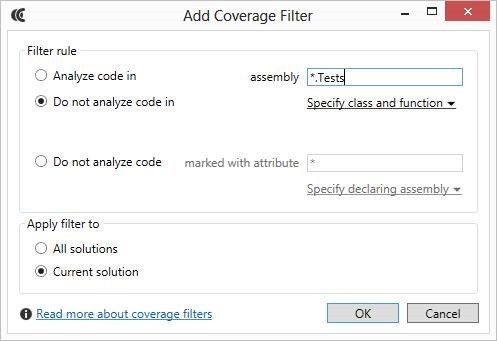 We can filter the test assemblies out by using Coverage Filters. Using the dotCover | Edit Coverage Filters… menu or the keyboard shortcut Ctrl+Alt+K, Ctrl+Alt+F, we can manage Coverage Filters. By default, dotCover already filters out code marked with the System.Diagnostics.CodeAnalysis.ExcludeFromCodeCoverageAttribute attribute, but let’s add an additional filter using the Add filter toolbar button. Based on a filter string which can match assembly names, class names and method names. Using these, we have fine-grained filter capabilities available. Note that class names and method names can contain wildcards as well, which means we can filter out certain namespaces or filter out method names that start or end in a given pattern. Based on an attribute. We can use existing attributes (e.g. ObsoleteAttribute) as well as our own attribute. For example, we can create a DontCoverThisAttribute and use it throughout our codebase and let dotCover exclude all code marked with this attribute. 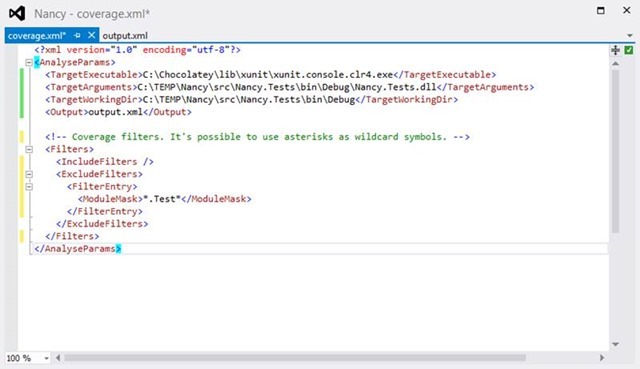 Since we want to exclude test assemblies from coverage and all our test assemblies have a name ending in .Tests, we can specify a filter using a wildcard pattern, as you can see in the image below. After clicking Ok, our filter will be applied during our next code coverage analysis run. As you can see from the next image, code coverage analysis has not been run on our unit test assemblies. 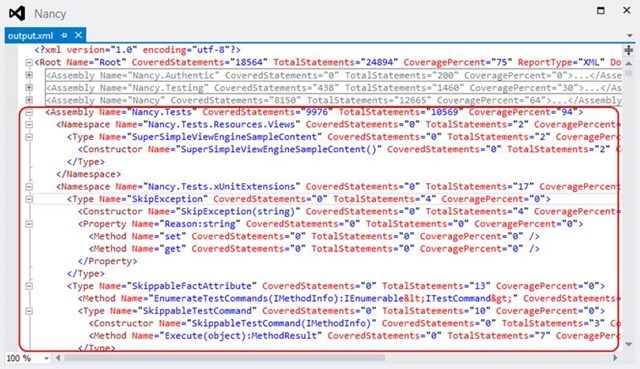 Note that coverage filters only tell the dotCover engine to not analyze code which matches a filter rule, it does not exclude the assemblies from the coverage report. If we want to completely hide the test assemblies from the results, we can right-click the tests node and use the Exclude selected node context menu. For additional information about using dotCover’s filters please check the web help. 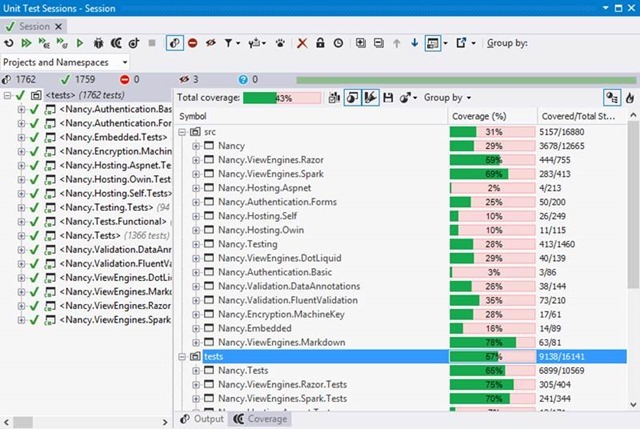 In the screenshot below, we can see an XML report of code coverage analysis running on a number of unit tests in the Nancy framework. Code coverage has been run for many assemblies, apparently even including the test assemblies themselves! For additional information about configuring the console runner, please refer to web help. Additional filter examples can be found in the web help as well. 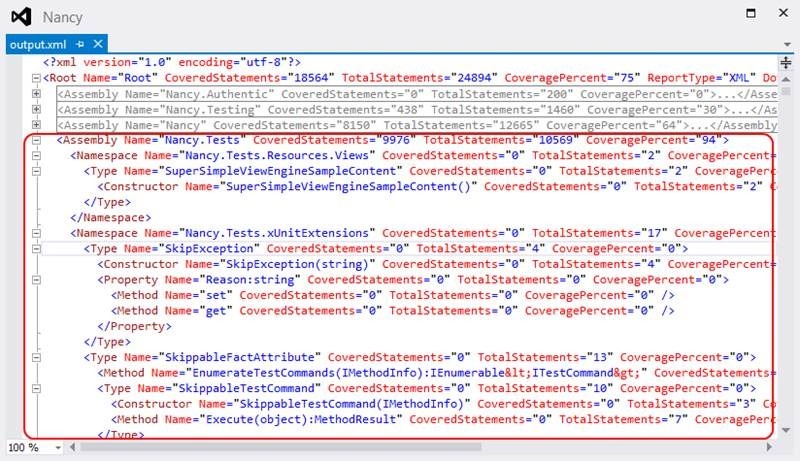 This entry was posted in How-To's and tagged code coverage, dotCover. Bookmark the permalink. It might be worth highlighting that the excllusion filters are case sensitive. Took me a while to figure that one out! You could do that with the attributes or by filtering on a certain assembly. 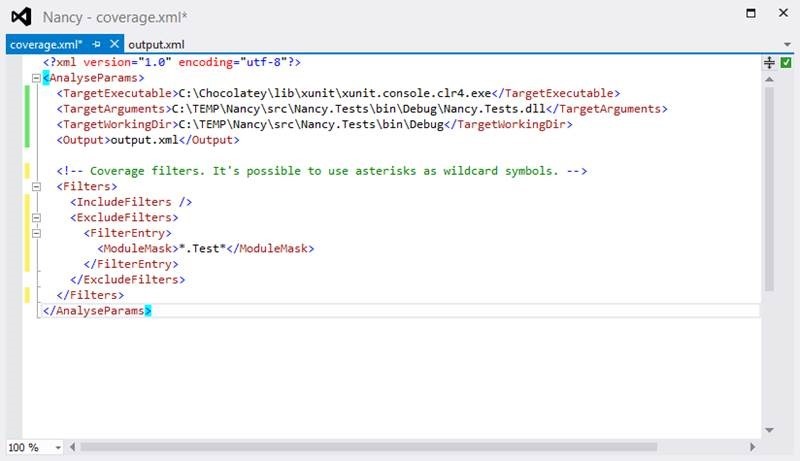 dotCover intends to show which lines of code are tested, and that should include private methods as well.